The North Coast WWII History Museum features regional memorabilia and exhibits that shine a light on the life and history of those who served at home and abroad during World War II. 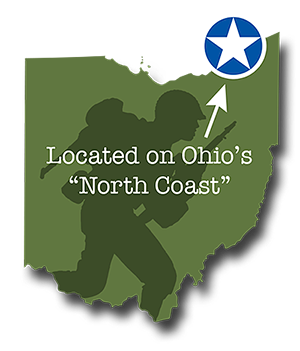 Visit and explore exhibits showcasing notable contributions and service by North Coast and Ohio residents. Dive deeper into history by exploring special exhibits focusing on the invasion of Normandy, June 6, 1944. 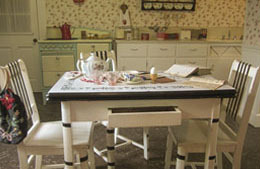 Click here to view a pdf slideshow of some of our displays including our all new 1940's style homefront kitchen. View displays featuring US armed forces in WWII. Learn about the uniforms, weapons and gear that equipped our Soldiers, Sailors and Airmen. Explore the German forces through exhibits of uniforms and equipment. 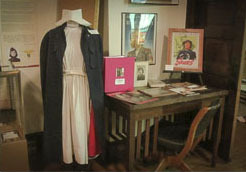 Embrace the Homeland Experience through displays and artifacts detailing the lives of those back home during WWII. Witness history through exhibits featuring regional and local WWII Veteran. While admission is free to D-Day Conneaut and the North Coast WWII History Museum, donations are always welcome. Your generous donations help keep these incredible stories and the history of these brave men and woman alive for generations to come. The museum is open Memorial Day Weekend through Labor Day Saturday and Sunday, 12-5 p.m. or by special appointment. Extended hours available during D-Day Conneaut. Please consult the event schedule for more information on hours and special programing. Schedule a VIP group tour today by emailing us at: ddaymuseum@ddayohio.us. Do you or does someone you know have memorabilia from a friend or family member who took part in the D-Day Landing or who served during WII and are looking for a place to keep the memory alive? Contact us at ddaymuseum@ddayohio.us to discuss the possibility of loaning items or contributing to our collection. D-Day Ohio is a non-profit 501-C3 charitable organization.